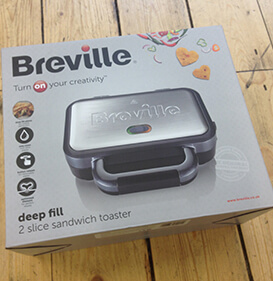 Win a British Sandwich Week Breville! We totally love this week! Do you enjoy your sandwiches as a go-to snack, a full on lunch or even a dinner time treat (or all of the above?!). Our preferable sandwiches always include our award winning spoiltpig bacon but we appreciate that the joy of the humble sandwich is that the possibilities are practically endless! So with all that in mind, we would love to hear from you about what your sandwich filling of choice is. At the end of the week we’ll pick one lucky person to win a wonderful Breville toasted sandwich maker along with of course some mighty spoiltpig! To enter, tell us what your fave sandwich is on one of our competition posts on Facebook, Twitter or Instagram, including #spoiltpig #BritishSandwichWeek, and we’ll select one of you lucky lot at random to be our British Sandwich Week winner! 2. Promotion Period: The promotion will run from 08:00 on Monday 15th May 2017 until 23:59 on Sunday 21st May 2017. 3. To Enter: Visit the spoiltpig Facebook, Twitter or Instagram pages and comment with your favourite sandwich filling on the promotional post. Entrants are required to ‘like’ the post or tweet and comment on the post or tweet with their answer including a mandatory #spoiltpig within their comment. 5. The Prizes: 1 x Breville sandwich toaster, 2 packets spoiltpig smoked back bacon, 2 packets spoiltpig unsmoked back bacon, 2 packets spoiltpig smoked streaky bacon, 2 smoked spoiltpig gammon steaks and 2 spoiltpig unsmoked gammon steaks. Only 1 prize available. 7. Winner Notification Winner will be notified within 1 working day of the draw by personal message on either Instagram, Twitter or Facebook (depending on their mode of entry). Winner will also be announced on social media posts. Winner will be required to respond confirming their address, email and telephone number within 2 working days of initial notification. Failure to do so will result in an alternative winner being selected from all valid entries.